huge amounts of traffic using Social Media Sites! Serious About Building A Long-Term Successful Business and want to make a full time income from home? For most business owners the difficulty isn't so much with coming up with a desirable product, but rather getting the right people to see your product. This video series overcomes that issue, and can be repeated over and over with any and all of your products. This is the exact same system I have been using to make a full time living with Social Media Marketing. The invaluable power in these videos is so extensive, powerful and revealing, but still so easy to use, that you are going to be totally pumped about wanting start applying this system in your business immediately! Everything you need is laid out clearly so that even a total newbie can leverage these methods for huge monthly traffic and profits with amazing speed! How Can I Start Creating A Reliable Monthly Income Using The Power Of Social Media? 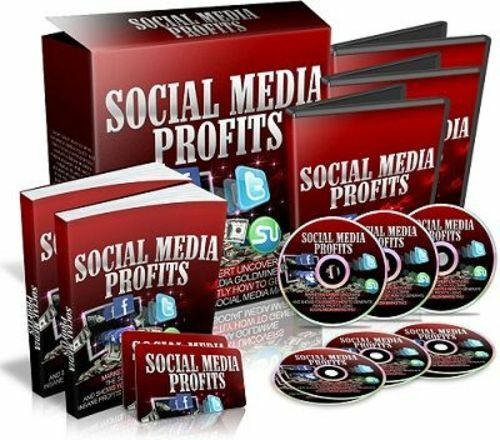 It's as easy as following the 'Social Media Profits' step-by-step video course and putting every step into action! Over The Shoulder Training. The 'Social Media Profits' Video Course will show you exactly how to make money using the power of social media. Just follow the simple step-by-step process and strategies outlined in the course and you will begin to succeed and profit! Low Cost / No Cost. Each of the strategies revealed in the Social Media Profits require very little or no cost to do. That means that if you don't already have the tools needed, I will show you where to get them for the best price! Techie Free Implementation. There are tons of courses and eBooks out there that do nothing but confuse the heck out of you and make social media marketing seem difficult. This course is so easy to follow that someone completely new to internet marketing could do it! These strategies all work effectively together because they help increase your main websites search engine rankings, and also they increase your overall online exposure.